The Samurai Jack Season 5 Trailer is Here! Cartoon Network has revealed the long-awaited Samurai Jack Season 5 trailer, featuring the return of the fan-favorite series to television after a long hiatus. Check it out in the player below! It’s been 50 years since we saw Samurai Jack and time has not been kind to him. Aku has destroyed every time portal and Jack has stopped aging, a side effect of time travel. It seems he is cursed to just roam the land for all eternity. 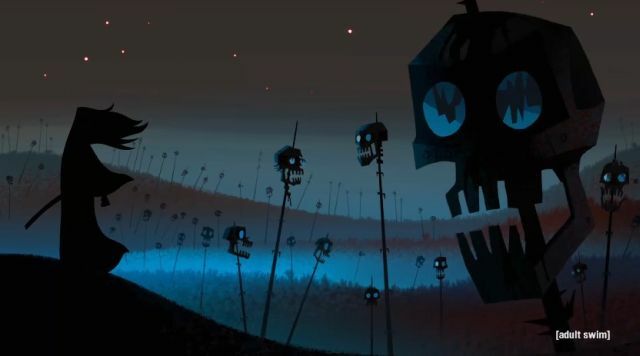 His past haunts him as well as a cult of assassins dedicated to killing him for Aku’s glory. Samurai Jack is created, executive produced and directed by Genndy Tartakovsky and produced by Cartoon Network Studios. Samurai Jack premieres on Saturday, March 11th at 11 PM ET/PT on Adult Swim. The original Samurai Jack series ran from 2001 to 2004 with a total of 52 episodes. The series was nominated for six Primetime Emmy Awards during this time, winning four. Since the end of its run, Tartakovsky has teased the character’s return.